Whether you are planning your next adventure or covering a leak in the roof, you'll find your trusty casa pura Tarpaulin up for any challenge! Our heavy duty tarps are made to last using a multilayered double laminated design, reinforced aluminum eyelets, and high-density polyethylene weave. The casa pura tarpaulin collection offers a wide range of every day to professional use tarps for every occasion. Use it to shield vintage vehicles, sailing boats or trailers. 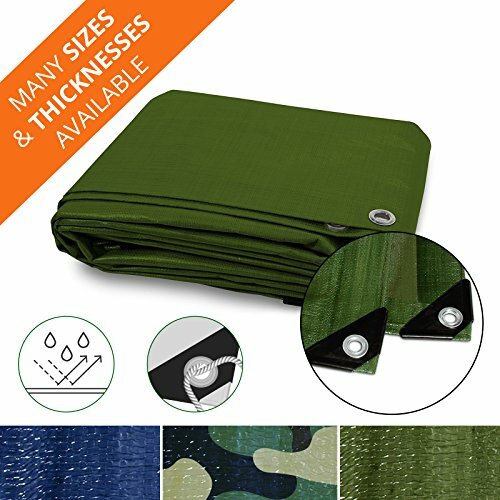 Take it on your next camping trip to protect your tent from rough ground and dampness or set up a cozy awning to relax under on stormy nights. The multilayered double laminated design offers you a waterproof and weather resistant defense while the reinforced poly rope around the hem spreads the tensile forces evenly to ensure you are well protected. The casa pura tarp is strong enough to overcome the elements while being so lightweight it can be easily removed and conveniently stored when not needed. Such a versatile tool will never cease proving its value. Note: Please note that the given sizes are approximate. Due to the production, the product can be subject to variations in size of up to +/- 5%. WEATHERPROOF: Use our tarp anywhere; they are waterproof, rot proof, shrink proof UV and mildew resistant making them efficient in any climate. If you have any questions about this product by casa pura, contact us by completing and submitting the form below. If you are looking for a specif part number, please include it with your message.